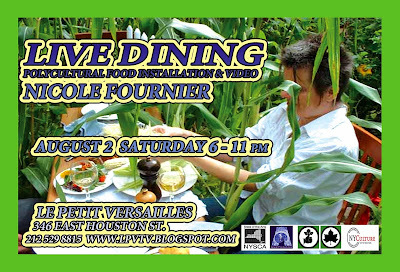 At Petit Versailles tomorrow we are hosting Nicole Fournier from Montreal who presents LIVE DINING an installation incorporating a dinner of local produce. While she's planning food for about 12 people I wanted to invite others to join us and add their own fresh from the market delectables to share. It's all very casual and there will be video playing later into the evening. Let me know if you will join us Saturday 8/2/08 @ 6pm. At 7 pm we will skype Richard Reynolds in London to discuss his book On Guerilla Gardening which includes Petit Versailles "gg" activities. Copies of the book will be available for sale courtesy of Jason Bennett & Bloomsbury Press.